I hate when the seasons change! Unfortunately I crushed my spleen in a car accident many years ago and since then I get sick when the season changes. So I find myself fighting off being sick at a pivotal moment while prepping for the New York Comic Con this weekend. The challenge has been maintaining my focus. Pushing through being sick is extremely frustrating. For me the common cold is like having the flu. Once I start down the track of being sick it is hard to do much of anything because my energy level drops so quickly. It is discouraging to be creative during this time. Although I have been prepping for months, there is still quite a bit of loose ends to tie up. Pick one thing and get it done. I keep telling myself this everyday. You should have a very clear objective. If you didn’t know YOU CAN NOT MULTITASK! We believe we can but unfortunately this is not true. When we try to do more than one thing, all the things we are trying to do at the same time suffer. If you are not giving all of your attention to one direction, then you will not get the results you are looking for. Action moves you towards your goal. You have to be relentless in your pursuit regardless of life’s distractions. If you really want it, even when you are sick, you have to be laser focused on one objective and GRiND! Each step, forward or backward, is progress. You can only track progression if you are moving. If you are standing still, you have nothing to measure. When you fall, you know that you are putting in the work so get back up and do it again. You may not see it immediately but you are already going in the right direction. The path will soon be clear. 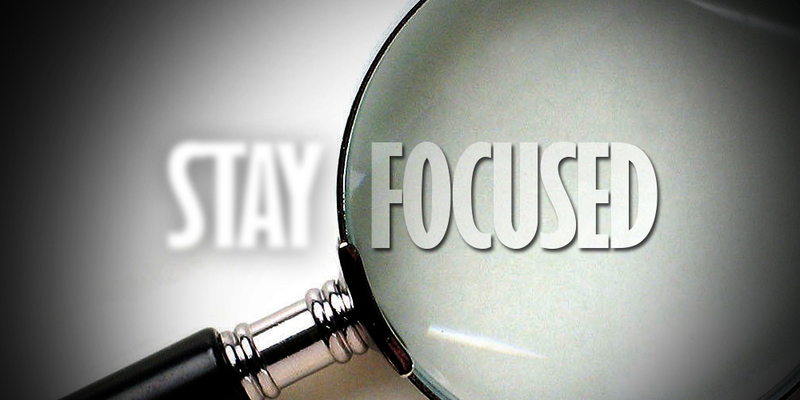 STAY FOCUSED!